Deluxe Set Includes 4 Trampoline Paddles, 3 Rubber String Balls & Storage Bag! This is the ultimate outdoor game set for the entire family! Trampoline Extreme Paddle Ball is challenging and fun.....It has so many ways to play from paddle ball to volley ball, and everything in between. It is an exciting paddle-style game featuring a flexible disc that propels an elastic ball to your opponent. 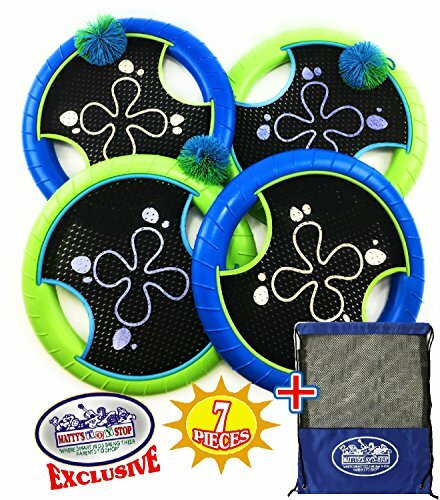 This lightweight set is ideal for exciting sports play on the beach, in the park, or in the backyard, and the storage bag makes for easy transport. AWESOME for water balloons too! Makes a great flying disc and floats too.